If you haven’t yet, it isn’t too late to sign up for the nutrition workshop. We are going to focus on macros and meal prep. 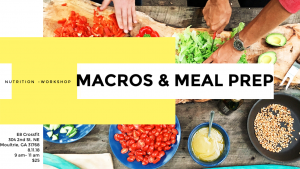 If you are new to macros, need to fine-tune your numbers, or need help simplifying your weekly meal prep this class is for you! Call the gym or stop by to sign up! Only $25 to get started on the right path! August 11th at 9 a.m.
Well pre-planning started this week and I am back to work and that means back to the early morning class for crossfit. Ideally, I get up every morning at 4 a.m. to eat my oatmeal and get ready for my 5 a.m. workout. Some days I wake up ready to go and fully recovered to workout, which is rare having a 6 month old who isn’t sleeping through the night. I would argue that sleep is just as important as nutrition, when it comes to allowing your body to recover and perform at it’s best in the gym. An adequate amount of sleep not only makes you feel better and reduces those dark under eye circles, it also contributes to better workouts and recovering from those workouts. While you sleep your body is repairing any “damage” done throughout the day. Your central nervous system, which aids in muscle contraction, reaction time, and response to pain is affected by sleep. Your endocrine system is in charge of releasing hormones and is also affected by the amount of sleep you are getting. This matters because if your body is not recovering adequately for several days, your body will start slowing the release of important hormones like testosterone and cortisol. This will obviously affect muscle growth over time. Supplements are also a good way to help your body recover from the constant grind of workouts. I personally don’t take any since I am still breastfeeding but Josh does. Josh started taking magnesium and it has really impacted his ability to get into a deep sleep. If you are active and are not allowing your body to fully recover, you are hurting yourself in the long run. 2-a-days are great, 3-a-days are awesome, but are you recovering at night? Are you staying up late trolling on Instagram or giving yourself time to relax and recover. Going into a workout tired and hurting, is setting yourself up for an injury. I am not saying that you shouldn’t go to the gym because you didn’t sleep well that night. If that were the case then I wouldn’t go very often. Friday I was dog tired but I was determined to go workout. Instead of going full-out and wearing myself out, I kept a steady pace and really focused on my technique. When your body is tired and not fully recovered you are going to be more likely to make a mistake and cause an injury. So on those days that you’re tired and just “not feeling it”, slow it down and just get the work done. Don’t worry about the time and intensity so much. I think everyone could use an easy week of meal prepping this week. You either are going back to work if you are a teacher or you are sending your child back to school. If you are in neither of those categories, you are welcome for an easy week of cooking! It doesn’t get much easier than broccoli and rice, and to be honest who doesn’t just love yellow rice. Jasmine rice is my pick all the way for a good bowl, but yellow rice I can devour anytime. With this meal you have your protein and carbs set. Depending on the amount of oil or butter you use will determine the amount of fat you have. The pork chops will add some fat to the meal, but nothing detrimental. I feel like all too often beets get over looked as an ideal meal prepping dish and just as a meal period. I am team beets all the way. This beet salad couldn’t be more simple. I like to boil my beets, that way I don’t have to keep a close eye on them while I meal prep. Simply boil them until you can stick a skewer completely through the center. Once cool enough, rub the skin off under cold running water. I love cooking salmon on the grill. If you don’t have time to grill in the afternoon you can always opt to cook it in the oven. I would still prep my salmon that morning or the night before so you don’t have to worry with prep on the night of. We like to rub both sides down with olive oil and season with salt (very little), pepper, garlic powder, Tony Chachere’s (is salty), lemon zest, and lemon slices. Roasted vegetables are a staple when it comes to meal prepping. They are so easy, tasty, and very nutritional. Vegetables are were we get most of our micro-nutrients. If you are on a low carb diet or on a caloric deficit, vegetables are a great choice. They’re less calorie dense, so you get to eat more volume and they have more fiber, which keeps that full feeling longer. Win Win! Make sure to calculate how much oil you are using on these vegetables so you can keep track of your macros. What I like to do is separate my vegetables and weigh them separately. If you were to make a recipe for this you would likely get an inaccurate amount because you could have more of a carb-heavy vegetable like sweet potatoes than on the next serving. My favorite vegetables to roast are brussel sprouts, sweet potatoes, and butternut squash. I like to roast zucchini and squash as well, but you need to flip them to ensure that one side does not get soggy. I like to drzzle with balsamic vinegar after they have cooked. This does say steak bowl, but I am going to slice pork loin instead. Josh is doing a cut, which means he has cut back on his caloric intake. Which reduces/changes his macros, mostly his fat. He is doing really well with it. Only week 2 and he is already seeing a decrease in weight. No loss of strength or stamina in the gym, so he doesn’t that he is losing any muscle. This bowl is great for meal prepping because it requires you to marinate the meat overnight anyway. I always forget to save part of the marinade for the bowl and dump it into all the meat. If you get to going too fast and pour it all in at one time, don’t worry it will still taste good. Make sure you pre-cut your vegetables and slice your meat thin so it cooks quickly the night of. You can cook this entire dish ahead of time if you are short on time during the week. If you are on a low carb diet, you can skip the rice. If not, I suggest using jasmie rice, it is sticky and delicious in a bowl like this. THIS TOAST. Dear goodness gracious, this meal is SO good. If you haven’t ever tried the salad version I highly suggest you do before you eat this toast because you won’t ever want to go back to the salad version. We used a fresh whole grain loaf of bread last time, sliced it thick, and it held up great with all the toppings piled high on it. Instead of using mayonnaise, I used non-fat greek yogurt and it was great. I like to top my toast off with dill and it was the perfect addition. Josh usually has two eggs soft boiled with is meal and two packs of tuna. I opt for one of each. If you are watching your fat intake, make sure you aren’t over doing it on the oil. If you are watching your carbs, you can opt for the salad version. But why would anyone want to restrict carbs?! Just workout more. Carbs are delicious and worth it!